I'm passionate about STEM and how we can build the future together! 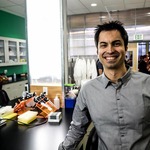 I've helped to co-found 4 biolabs within the last 3 years (Counter Culture Labs, Berkeley Biolabs, IndieBio and LAbLaunch) and looking forward to spreading the tools of biotechnology to everyone. Pembient can help save the Rhino and then all of the other endangered animals! I'm rooting for them!